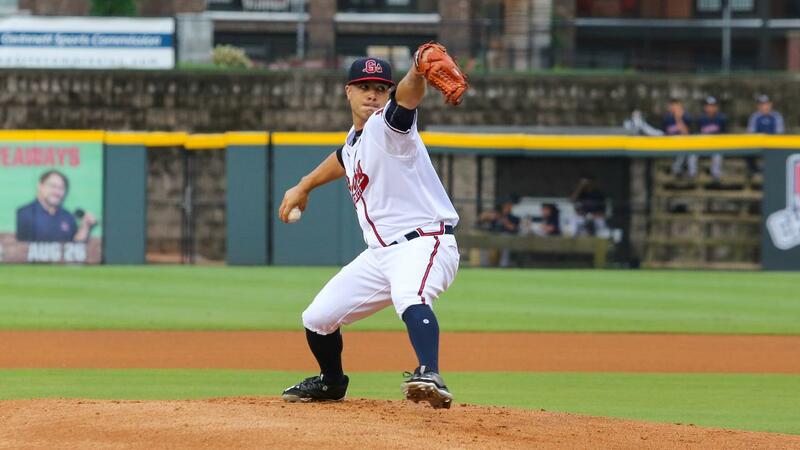 LAWRENCEVILLE, GA - The International League has named Gwinnett Braves' right-hander Manny Barreda its Pitcher of the Week for August 28-September 4. Barreda, 28, went 1-1 with a 0.00 ERA (0 ER in 13.0 IP), a league-best .130 opponent average and one complete game over two starts during the week. He tossed a 6.0-inning complete game in game two of a doubleheader on August 30 at Norfolk, but took the loss with four unearned runs on four hits as Gwinnett fell 4-3. Barreda's final start of the year came in the 2017 season finale on September 4 vs. Durham, when he pitched 7.0 scoreless, two-hit innings to lead the G-Braves to a 3-0 win. Signed by the Atlanta Braves as a minor league free agent on December 22, 2016, Barreda opened 2017 with Tijuana of the Triple-A Mexican League before having his on-loan assignment recalled on August 4. The Sahuarita, AZ native went on to make seven starts for Gwinnett in his affiliated Triple-A debut, going 3-1 with a 1.83 ERA (8 ER in 39.1 IP). He held IL opponents to a .185 average, walking 19 while striking out 33. Barreda is the 20th pitcher in Gwinnett's nine-year history to win the IL Pitcher of the Week award and the third to win it this season. Right-hander Lucas Sims won for April 17-23, and left-hander Andrew Albers won for July 10-16. The Gwinnett Braves concluded the 2017 season with a 71-71 record, second place in the IL South Division. Gwinnett Baseball returns for its 10th season in 2018, and the team will play under a yet-to-be-announced new identity. Gwinnett opens the season on the road, playing at Norfolk on Friday, April 6 at 7:05 p.m. The 2018 home opener at Coolray Field is set for Thursday, April 12 at 7:05 p.m. vs. Rochester. To stay up-to-date with all team news this off-season, visit GwinnettBraves.com.